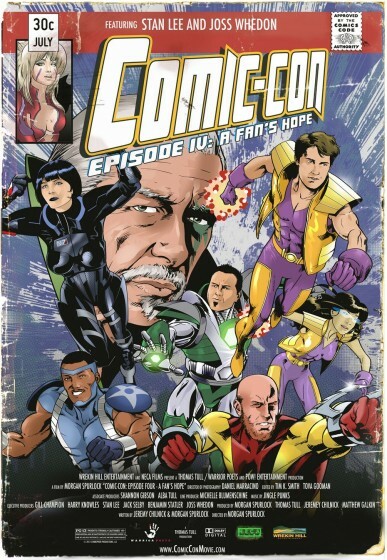 COMIC-CON EPISODE IV: A FAN'S HOPE finds director Morgan Spurlock taking a break from his usual contrived socio-political manifestoes starring himself (e.g. SUPERSIZE ME) to shoot an actual documentary about the 2009 San Diego Comic Con. From its humble beginnings as a small comic book convention in 1970, the San Diego Comic-Con has grown to be arguably the most influential event in the world of pop culture. Comic books are now just one small aspect of the con, with TV and film having come to the forefront as producers realize that this is how best to reach their target audience of fanboys with disposable cash. Spurlock focuses primarily on five individuals in the film. Eric and Skip are artists hoping to break into the comic book industry, and we see them present their work to established artists and publishers for (often harsh) criticism. Holly is a costume designer who has created professional quality costumes of characters from the Mass Effect video game in hopes of winning the Comic Con costume contest. Chuck is a comic book dealer who has been at the Comic Con since its inception and now laments how the event is no longer the cash cow for him it once was. Finally, James is a fanboy looking for a chance to propose to his fangirl at the con. While these five stories give the film a narrative and down to earth human dimension, COMIC-CON EPISODE IV gives a broader overview of its subject via shorter interviews with various attendees and convention guests, including CLERKS writer/director Kevin Smith, Marvel Comics founder Stan Lee, Buffy/Firefly creator (and director of this summer's smash hit THE AVENGERS) Joss Whedon, HOSTEL director Eli Roth, comic book writer/artist Frank Miller, and Ain't It Cool News webmaster/founder Harry Knowles. As much ground as it tries to cover, in the end there's not a whole lot of weight or substance to Spurlock's film. Those looking for a better understanding of how and why geek culture has come to play such a large role in defining modern pop culture won't find much here. Still, if you just want to get an idea of what Comic-con and the sort of people who go there and why, it does the job in a reasonably breezy and entertaining way. 2 1/2 out of 4 stars.